During the past year, as India undertook tough tours around the world, all the talk was about "away performances". Virat Kohli had done quite well outside India, but he had had a miserable series in England on India's previous visit; he more than made up for that last summer. Cheteshwar Pujara had been uniformly below par overseas, but had a fair-to-middling outing in England and was excellent in Australia. The way players perform in their home countries and in away locations has always been a fascinating topic. Responding to readers' requests on my article ranking the top 25 Test batting performances of all time, for this exercise I have split the away performances between Asia and non-Asia. A couple of clarifications before we begin. When Australia played South Africa in England in 1912, or Sri Lanka played Pakistan in Bangladesh in 1999, it is clear that the location was neutral: in other words, away for both teams. When we consider Tests played in the UAE between Pakistan and other teams, for all practical purposes these are home matches for Pakistan and away matches for the opposition. The seven Tests Pakistan played in the 1950s in what was then Dacca are treated as home matches for them. All innings ending in dismissals are counted as 1. All not-out innings above the average Runs per Innings (RpI) are counted as 1. All not out innings below the average RpI are assigned proportionate innings values between 0 and 1.0. The article is current up to the end of the New Year Tests in Sydney and Cape Town. 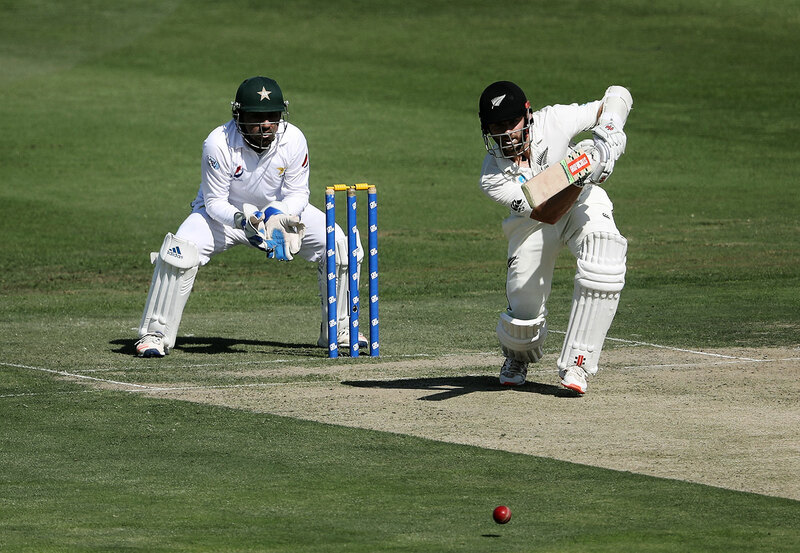 For current players, the situation is fluid: the positions of, say, Kohli or Kane Williamson might change significantly with time. "Who is second?" is often the question when we discuss batting numbers, for inevitably in performance-based measurements Don Bradman reigns supreme. And so he does here, with a WBA value of just under 90. At home, he played a series each against the weaker teams of that era: West Indies, South Africa and India. In those, he plundered close to 2000 runs at a WBA of 117. His WBA against England was only 70, and the Bodyline series had a lot to do with that. Two of the three Ws, Clyde Walcott and Everton Weekes, occupy second and fourth places. Their performances at home were almost identical: either side of 2500 runs, and WBA in the 60s. This was in the 1950s, when West Indies were feared more for their batting than bowling. Steven Smith splits the Ws. He has been magnificent at home: an average of 77.3 and a WBA of 62.7. The huge difference is due to Smith's ten not-outs in 50 innings, which shows the value of the WBA. In fifth place is Mohammad Yousuf, whose golden run in the early part of the millennium was no doubt responsible for his WBA of 60-plus. Kohli has been outstanding at home and this is reflected in his WBA of near 60. The incomparable Garry Sobers follows him; his 365 not out contributes a lot to Sobers' position. Herbert Sutcliffe, who had a home average of over 60; Brian Lara, no doubt helped by his triple- and quadruple-century; and Mahela Jayawardene, who was colossal at home, complete the top ten. Pujara and Kumar Sangakkara are the next two batsmen, with WBA values just above 56. Bradman had a huge away WBA value of 91.2 - better than at home. Granted that he scored all his 2674 runs in England, but the bowling was top class: Harold Larwood, Maurice Tate, Bill Bowes, Ken Farnes, Bill Voce, Gubby Allen, Alec Bedser and Hedley Verity, in their home conditions. 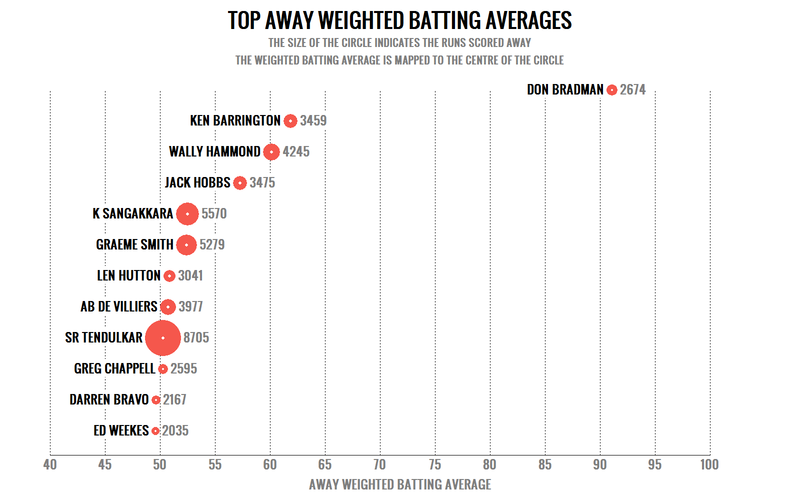 Ken Barrington is deserving of second place, with a WBA just above 60 and a fair collection of runs. Barring the West Indies, Barrington did very well everywhere. Wally Hammond's high WBA of 60 is mainly the result of his huge scores against an average New Zealand attack. Jack Hobbs' high average was obtained mostly in tough conditions in Australia. Sangakkara comes in next with an excellent WBA of 52. Graeme Smith got some easy runs in Bangladesh, but he was also magnificent in England. Len Hutton was very good in some tough West Indian Tests. Surprisingly AB de Villiers did poorly in Zimbabwe and Bangladesh - thus one could say that he earned his away WBA of around 51 in tough locations. Sachin Tendulkar had a good aggregate and excellent figures in almost all countries, leading to a WBA of just over 50. Greg Chappell is the other batsman to have a WBA value of over 50. Darren Bravo and Weekes come in next with WBA values just below 50. Now for the great divide between Asia and the other parts of the world. First, let us look at the top non-Asian batsmen in Asia - India, Pakistan, Bangladesh, Sri Lanka and the UAE. Only 16 batsmen qualify on the criterion of having scored 1500 or more runs in Asia. Lara conquered Sri Lanka, was reasonable against Pakistan, but below par in India. Still, an overall WBA of nearly 59 is outstanding. Clive Lloyd found Asian pitches to his liking: over 80% of his runs were scored in India when India possessed a world-class spin attack. Stephen Fleming has an impressive WBA value in Asia of just over 54, although this includes 231 runs in two innings in Bangladesh. Darren Bravo did very well in Asia, with a WBA value of 53. De Villiers was terrific against Pakistan, and at about par in India and Sri Lanka. He did not get any cheap runs in Bangladesh. 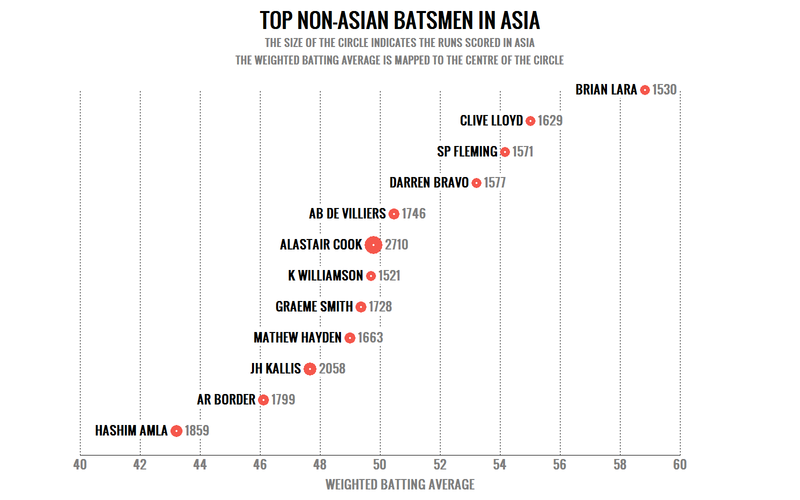 Alastair Cook is the leading non-Asian scorer in Asia, and his haul of 2710 runs comes at a good WBA of 50. He scored well over 1000 runs in India, and was equally effective in the UAE and Bangladesh. Williamson moved into seventh position after his sterling performances in Abu Dhabi last year. Graeme Smith had some easy runs against Bangladesh but performed very well in Asia overall. Matthew Hayden set India alight, scoring just over 1000 runs there, and also made a match-winning hundred in UAE. Jacques Kallis was below par in Sri Lanka and Bangladesh but did very well in India and Pakistan. Therefore, his WBA of just over 47 was worth its weight in gold. Allan Border had no easy runs and was particularly impressive against Pakistan. Hashim Amla rounds up our dozen. Now a look at those Asian batsmen who shone outside their continent. It may come as a bit of a surprise that the table is headed by four Indian batsmen - or maybe not, when we see their names. Rahul Dravid is sometimes pushed into the background when we talk about Indian greats but in this chart he is right at the top. His WBA is just above 48 in tough non-Asian locations. He was excellent in England, West Indies and New Zealand, just below par in Australia, and not so good in South Africa. Equally deserving is Sunil Gavaskar, in second place with a WBA value of nearly 48. Gavaskar's high was in the West Indies, with a WBA exceeding 58, and he clocked a value of nearly 50 in Australia. In England and New Zealand, his WBA was just above 40, but let us remember the times Gavaskar played in. Tendulkar comes in next with a very good WBA of 47-pus, and heaps of runs - well over 6000. In Australia and England, his WBA values were either side of 50. In the other three major non-Asian countries, his WBA was between 43 and 49 - an excellent achievement. Kohli redeemed himself wonderfully in the last Test series in England and did well recently in Australia. He has scored 1274 runs in Australia and 558 in South Africa at high averages. Despite Sangakkara's overall high batting average, his non-Asian WBA value is only 47.6. His is a mixed bag: very good in Australia and New Zealand but below par in England and South Africa. If the top half of the table was dominated by Indian batsmen, the lower half is all Pakistan. Their four top batsmen - Javed Miandad, Yousuf, Inzamam-ul-Haq and Saleem Malik - have non-Asian WBA values of 40-44. In the cases of Miandad and Malik, there were no cheap runs. Marvan Atapattu is the odd man out in the bottom half of this table, with a WBA of about 44. He was helped by an average of 114 against Zimbabwe. VVS Laxman and Majid Khan come in next, with WBA values just below 40. Now let us look at some comparative charts. The first one shows batsmen who performed way better away than at home: an unusual breed. The requirement is that the batsman should have scored at least 1500 runs away and 1000 runs at home. As is to be expected, no top-scoring batsman is present in this table: it is rare to find a batsman scoring in excess of 8000 runs who fares poorly at home. Mohinder Amarnath, the warrior, was magnificent in the West Indies (when pace was king), Australia, Sri Lanka and Pakistan. He had a tough time only in England and New Zealand. He was certainly one of India's batting heroes overseas from the mid-1970s to the mid-1980s. His WBA values are 30.4 and 48.5 respectively. Bravo has a home WBA below 30 and an away WBA of nearly 50. This is very difficult to explain, and may also account for the frustrations of the West Indies selectors. Bravo has been very good in New Zealand, India, Australia, Sri Lanka and Bangladesh. The only place he has failed has been England. John Reid (Sr) found the going tough at home (25.1) but was comfortable when he was on the road (36.3), especially in India and South Africa. Alan Knott had WBA values of 26.0 and 35.6 at home and away. Tony Greig had good averages in India, Pakistan and the West Indies, but found pitches in England difficult to handle (33.3 against 44.8, home and away). Hammond's away numbers are bloated by a single innings in New Zealand: the 336 not out off amateur bowlers. Barrington found the scoring easier away from home; his home WBA was 47.1 and the away value 61.9. Graeme Smith did much better away than home (40.1 v 52.4) and was outstanding in England, New Zealand and Pakistan. Like Reid, Fleming found home pitches tough to handle - 33.2 v 42.6 away. Dennis Amiss had similarly contrasting figures - 37.8 and 48.0. Ajinkya Rahane is a modern Indian batsman who has found the going easy when travelling - 34.6 at home v 44.8 away. Now we come to the batsmen who did far better at home than away. The requirement is that the batsman should have scored at least 1500 runs at home and 1000 runs away. 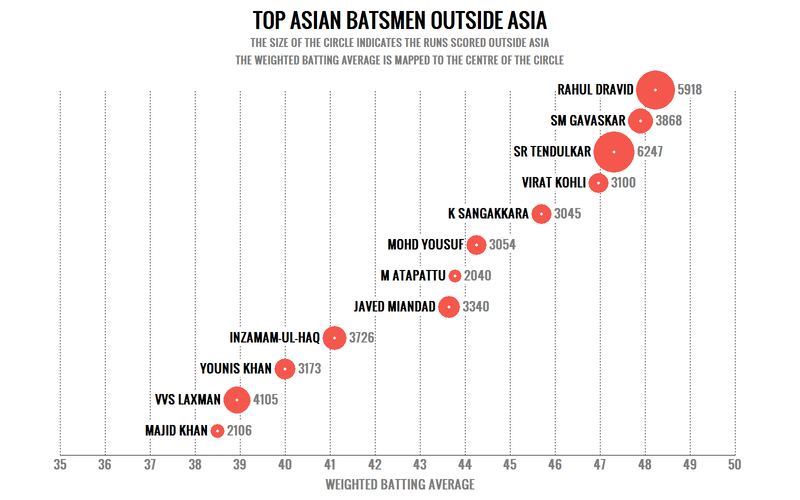 One glance at the graph indicates that this list too lacks top-scoring batsmen. Between the two lists, there is just one batsman who has over 9000 Test runs (Graeme Smith). 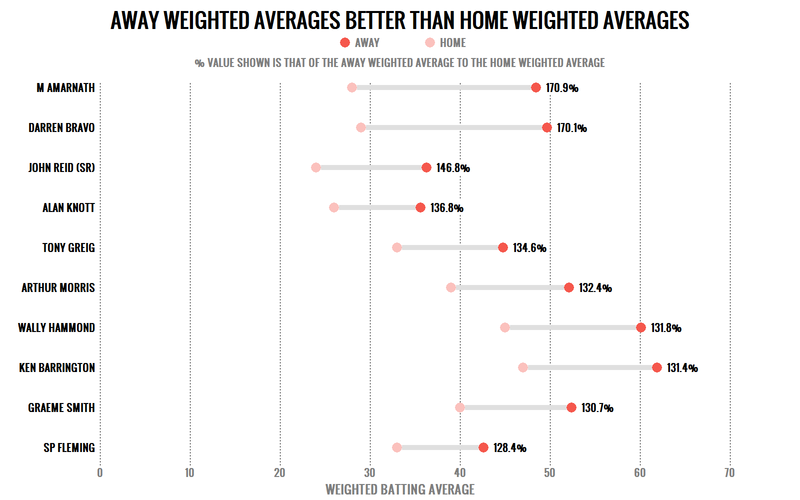 It is possible that batsmen who score many runs cannot really afford to have too much of a variation between their home and away performances: to do well in over 120 Tests, one has to be good everywhere. Mudassar Nazar had a WBA of 48.6 at home and 26.5 away. That is some difference: his WBA did not cross 30 in any away location (as defined earlier in the article). Walcott, the West Indian giant of the 1950s, was a king at home and a commoner away. He averaged nearly 64.6 at home and around 39 overseas. He did well in India and New Zealand but poorly in England and Australia. Brad Haddin, though not a front-line batsman, scored enough runs home and away to qualify. His WBA figures are 38.6 and 23.2. Dilip Vengsarkar is a surprise. His numbers are 48.7 and 30.5. When we think of Vengsarkar, we think of his exploits in England. However, even those magnificent hundreds at Headingley and Lord's did not give him a high average in England, and he had sub-30 averages in Australia, West Indies and New Zealand. Navjot Sidhu had a home WBA of 52.3 and fell nearly 20 short of that away. Denis Compton had a home WBA of 54.5, which fell off to 35 on the road. Craig McMillan found travelling tough - to the tune of 16 points. Desmond Haynes had figures of 49.5 and 31.8. It is interesting to compare this with his opening partner, Gordon Greenidge, who did almost as well away as he did at home - 45.2 and 40.2. Two Australians who played the game a century apart, Victor Trumper and Michael Clarke, found Australian pitches more to their liking. Pujara was on the list but fought his way off it with his recent performances in Australia. 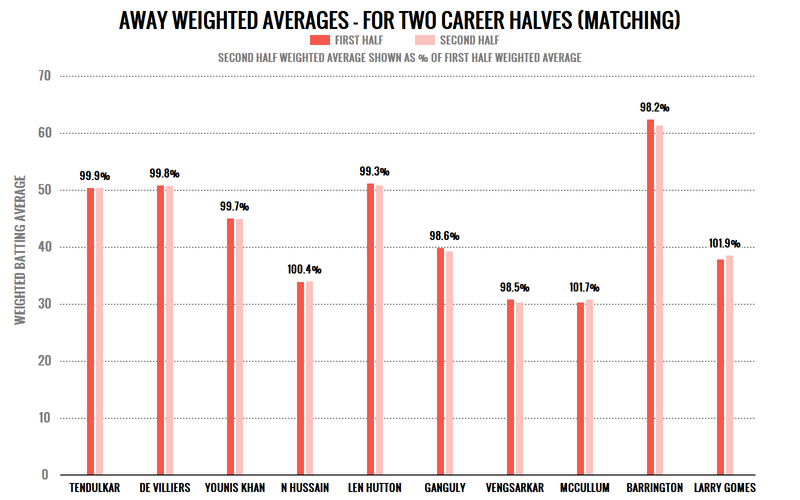 A nd now a look at the career halves of batsmen while playing away. This will let us identify those who improved their away form significantly as their career progressed, those who declined similarly, and those who remained steady. The requirement here is that the batsman should have made 1000 runs or more in each half. It should be remembered that these are away figures and it is difficult to draw any conclusions about corresponding home figures. Imran Khan at the top is a surprise, but his batting improved dramatically as his career progressed and he doubled his average. In quite a few Tests, Imran played purely as a batsman. Atapattu's improvement is not a surprise, considering his first six innings, all away, were 0, 0, 0, 1, 0 and 0. Williamson's two halves are chalk and cheese - WBA of just under 37 and just over 62, and the gap is widening. It is similar with Pujara, whose figures away are improving at a remarkable pace. Fleming also improved dramatically and it is interesting to note that he scored many of these second-half runs in Asia; two innings of above 250 each helped. 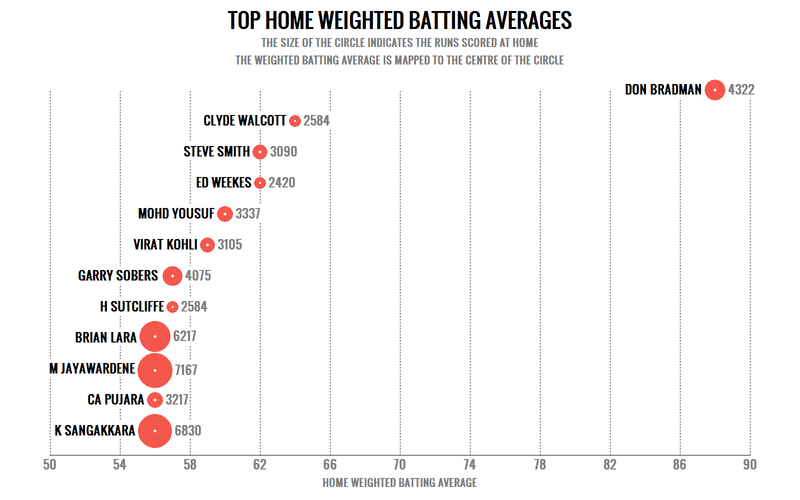 Doug Walters and Ian Redpath, two Australian batsmen of the 1960s and '70s, have almost identical variations in their career halves. Readers will remember that Amarnath set non-Indian grounds alight - it is also true that most of these great innings were played in the second half of his career. Just look at that near-60 WBA value. Sobers' inclusion is a surprise, considering that the 365 not out came early in his career. However, that innings was his first hundred and he was only averaging 30 until then. Malik and Sangakkara are next in with 40% improvement values. 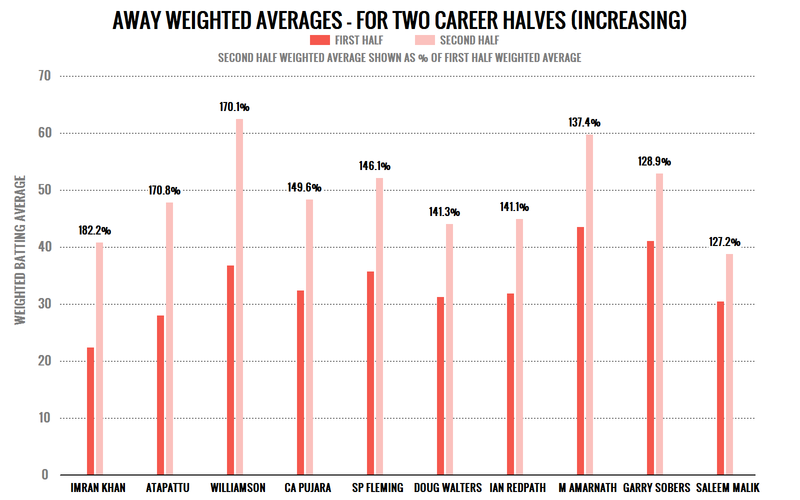 In the graph above, we look at those batsmen who fell off dramatically while playing away. Neil Harvey had an away WBA of nearly 68, which fell to 37 in the second half of his career; a tour of South Africa at 132 and a visit to West Indies at 108 contributed most to his first-half average. Gavaskar had an average of 155 at the end of his first tour. This dropped dramatically as he visited England twice. Things became tougher everywhere as years passed, and Gavaskar had a WBA of only 35.6 in the second half of his career. Included in the first-half WBA of Hammond's 74.2 were innings of 251, 200, 227 and 336 not out. It is no wonder that his away average fell like a stone later. Alvin Kallicharran follows, with a drop of around 40%. Hayden was magnificent in India in 2001 and scored a memorable 119 in Sharjah in 2002. These contributed to his very good first-half WBA of 50.6, which fell to 33 in the second half. Adam Gilchrist had three excellent series in England, South Africa and the West Indies early in his career. These led to his away WBA of 53. He could not repeat this later in his career and his WBA fell to around 36. The graph above tells an effective story. The average values of the batsmen in it do not matter. The only thing that matters is that the first and second half away values do not vary by more than 2%. The cut-off is based on the number of Tests. It is clear that this graph has more top batsmen than the other tables. This may be because the best batsmen tend to have even careers. Tendulkar, at the end of 100 Tests, had played 92 innings away and scored 4517 runs at a WBA of 50.34. In the next 100 Tests, he played 84 innings and scored 4188 runs at a WBA of 50.28. That is some consistency. A difference in the second decimal! De Villiers also had almost identical values: a difference of a mere 0.09. Younis Khan, Nasser Hussain and Hutton had differences of less than 1%. The next five batsmen - Sourav Ganguly, Vengsarkar, Brendon McCullum, Barrington and Larry Gomes all have variations below 2%. Finally, an analysis specifically to address the oft-repeated concerns of readers. One batsman averaged 50 against the West Indian quicks and another averaged 90 against Bangladesh. The usual suggestion is to ignore the latter numbers. But who has the right to clarify a team as "weak"? What do we do about the weak bowling attacks of seemingly "strong" teams? How can we classify Mohammad Wasim's magnificent 192 in a match won by Pakistan by three wickets against Zimbabwe as an innings against a "weak" team? Or Ponting's 118 not out in Bangladesh in a similar win? 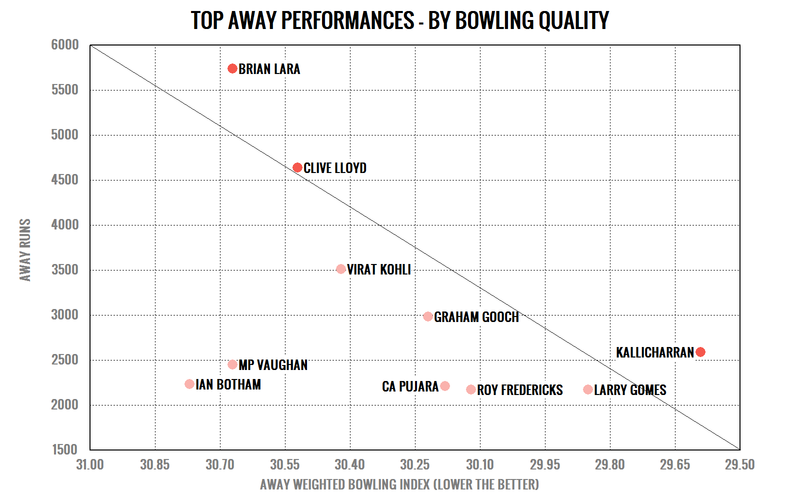 In order to deal with this, I have devised a bowling quality index for all away runs. Each run scored by a batsman in an away location will be weighted by the home weighted bowling average of the bowlers who bowled in that innings summed, and in this way we will arrive at the Average Weighted Bowling Index (AWBI). If Amarnath scored a hundred against four West Indian quicks in their pomp, he will be rewarded suitably. If Hammond scored 336 not out against a collection of amateur bowlers in New Zealand, his ranking will go down. The overall weighted bowling quality index is a measure of the quality of bowling faced. This will answer queries posed about the so-called "weak" bowling attacks. 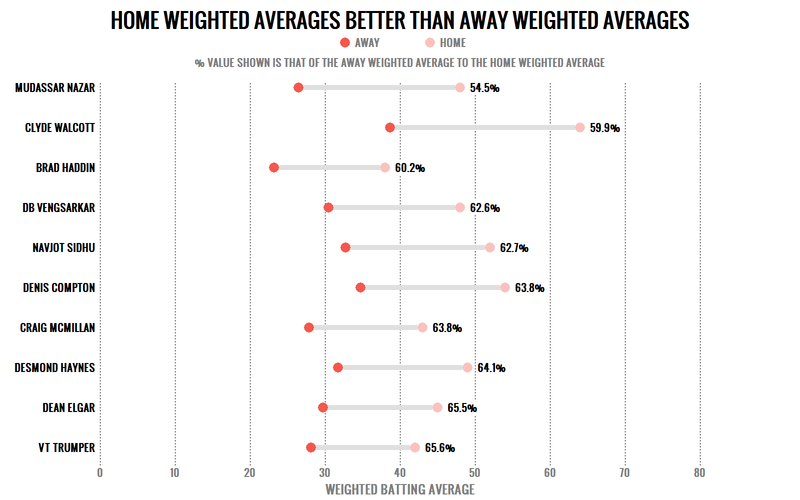 I have posted the away runs scored and the AWBI in a quadrant chart. Those to the right and above the diagonal line of excellence have either scored many away runs or have a low AWBI. Three batsmen - all West Indians - are in this elite zone. Kallicharran has a magnificent AWBI value of 29.59. There were no cheap runs to be had. His performances in India against strong bowling attacks were memorable. He scored just over 2500 runs away. Lloyd had a slightly higher AWBI of 30.57. However, he scored over 4600 runs, which helped him get on the right side of the line of excellence. Lloyd was particularly good in India against very good bowling attacks. Finally, Lara has a slightly higher AWBI of 30.67, but the 5736 runs he scored in away locations help him clear the line comfortably. He was outstanding in Sri Lanka and good in England. Of the other batsmen on the table, Kohli's position is interesting. He has scored 3508 away runs at an AWBI of 30.37. This might change significantly, and as he plays against quality attacks he could move closer to the line. Similarly, Pujara is scoring some tough runs and made his entry onto the graph after his 193 against a high-quality attack in the recent Sydney Test. Among all these numbers presented, which ones would I say are the most amazing metrics (taking care to keep the incomparable Bradman out of the discussion)? Readers can comment on this article here. Note that this link takes you outside ESPNcricinfo, and ESPNcricinfo does not monitor, publish, or otherwise associate itself with comments posted there. Which batsmen have played the largest number of all-time-great innings? Where will these young giants end their careers? Who are the most consistent players in Test history?